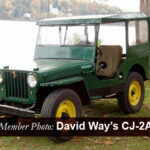 Is it a trim package, a CJ-5, or a CJ-6? Well, the answer is yes! In 1961, Kaiser was coming to the realization that it had an image problem. 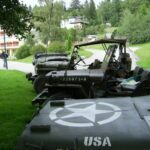 The broader masses believed the Jeep to be a great…vehicle — that is, if you needed to work on the farm, go hunting, or partake in some other industrious activity. 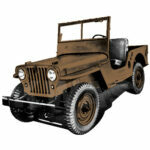 To fix this “problem” they decided to introduce a new, more “upscale” version of the CJ-5. 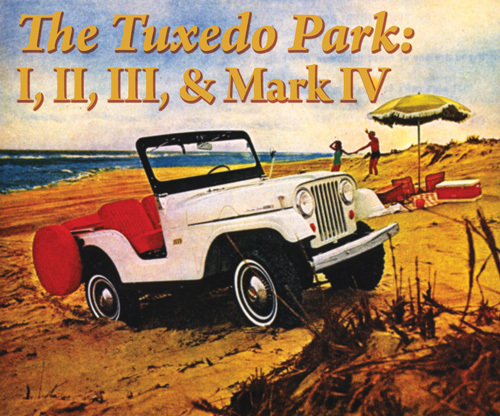 So…in 1961, the Tuxedo Park was introduced as a trim package. It is widely believed that these trim packages (Tuxedo Park I, II and III) were offered between 1961-1963, and included chrome add-ons, along with an “Indian Ceramic” steering wheel (in place of the standard black). The seats also received an upgrade to “Black British Calf Grain Vinyl with Indian Ceramic Facings” (Trim Code L-29). **If you suspect you may have one of these models, check the prefix of your vehicle’s VIN tag. The CJ-5A Tuxedo Park Mark IV has a prefix of “8322”, while the CJ-6A Tuxedo Park Mark IV has a prefix of “8422”. 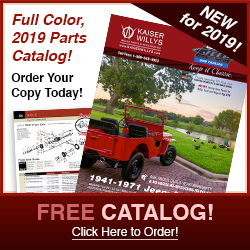 If you are looking for Willys replacement parts, Willys body parts and much more for your 1941-1971 Willys vehicle, you have come to the right place! My 1964 CJ5 has all of the Tuxedo Park chrome pieces, etc. The only difference is the 3 speed shift is on the floor. My Dad bought this new and there has never been changes made. Can anyone verify if this is a Tuxedo Park? I just purchased on Sunday September 25th 2016, a 1964 Jeep CJ5A Tuxedo Park. It is completely original except having at sometime had the 3 on the tree shift moved to the floor. 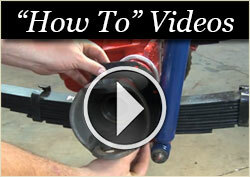 This Jeep has 61,000 original miles and runs and drives very smoothly. It has some surface rust and some small dents and dings and scratched paint. But not bad enough that I feel like restoring the body. It even has 5 hubcaps the 2 fronts with the holes for the hubs and both rears and one on the spare. I do want to get the seats recovered in red vinyl and find some kind of bar that fits the body to drape a bikini top across. This Jeep also came with a Complete Hard Top with roll-up windows not the typical slider windows in most tops. This Jeep spent most if not all of it’s life parked under cover on a ranch in the high desert of the Okanogan Highlands of North Central Washington State. 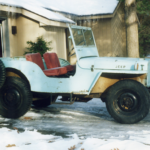 My first car was a new CJ-5A in blue with a blue interior. Ventilating windshield and every option available. Kept it until 1969 when I replaced it with a red and white, C101 Jeepsteer. Great vehicles! 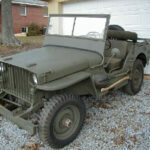 Try posting your Tuxedo Park on http://www.willysforsale.com if you haven’t already. 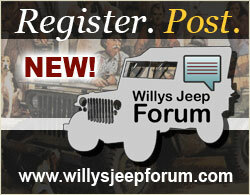 It’s our free Willys Jeep classifieds site. Have a great day! 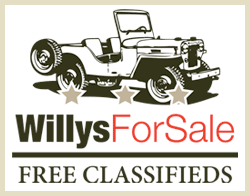 Hi Luke, try posting it for sale on our free classifieds site http://www.willysforsale.com. Have a great day! I have a beautiful 1966 Tuxedo Park for sale. Email me if anyone is interested. Just wondering what a 1966 tuxedo park is worth? Good condition. Hi Jc, From what I have seen they go anywhere from average condition $6,000 to excellent original condition $13,000-$15,000. Check out the NADA Guides for more information and also look at classified sites to see what they are going for in different conditions. Have a great week! I have a 1964 tuxedo park mark iv, all orig, no rust, 33k orig miles, I was wondering what it might be worth ? Another one for sale, on bringatrailer.com to boot! Good looking 1945, but it needs a rollbar. Safety first. I have one for sale, it is a 1964 mid restoration. Solid engine/runner. Very little rust (AZ car) asking $4500. Please email me w/ questions.